Finalist: Retailers Choice Awards 2009. Have you ever whacked your thumb with a hammer, hit your head on an open cupboard door, or bitten your lip? Maybe you’ve done all three at once. If you have done something dumb and had the frustration of having no one to blame but yourself, take comfort — you are not alone. But this book will give you more than just comfort. It will make you smile. A lot. You may even die laughing . . . so be careful. “I stayed up late last night crying my eyes out reading . . . it would dwarf any Marx Brothers or Stooge’s film any day.” J.N. Woodworth, (MD). “I laughed until I cried. Then I laughed some more.” Frank, (FL). “I laughed until my sides hurt . . . it is so funny!” Alicia Quinn, (OR). “Hysterical! My husband says he will be wanting to order a box of this book.” Irene Heirman, (TX). “It is hilarious! I laughed my head off.” Mike Miller, (TX). “When I read part of the book to a friend at a restaurant, the people at the next table began laughing so much, I gave them my book and ordered 50 more.” Mike Smalley, (TX). “We are just recuperating from [it]. It is hilarious!” Shelly Norman, (New Zealand). “I laughed until I cried!” Amy Bowman, (CA). “Sometimes I would laugh so hard, I was crying.” Jennifer Brotherton (TN). 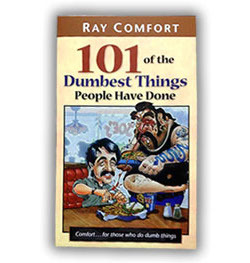 This book was written so that you could easily hand a friend, co-worker or family member a humorous book that also contains the gospel message.